Illusion ROM for Galaxy Nexus! 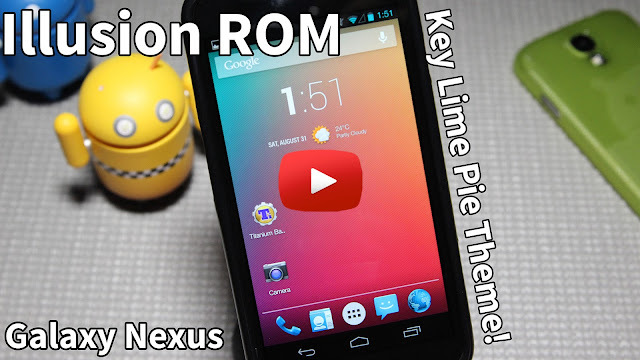 Key Lime Pie - GSM/Verizon/Sprint ~ AndroidRootz.com | Source for Android Rooting, ROMS, Tricks and More! Illusion ROM for the Galaxy Nexus GSM, Verizon, and Sprint variants is a great ROM because this ROM is completely different from the rest of the other ROMS. This ROM changes the looks and how it transitions compared to other ROMS. With Illusion ROM you get a sweet looking Key Lime Pie theme, this of course isn't the "official" look, but still is refreshing and is an eye catcher. Just simply go into Settings and then themes. In that section just select Key Lime Pie and your good to go! On that of that you get some cool transition between applications and how they disappear. Illusion ROM also includes neat features like Halo, Pie Control, and your other usual tweaks to make your phone even more cooler! Download Illusion ROM for Galaxy Nexus GSM, Verizon, and Sprint using the links below!